Question: Drying beans – did you have to do something to dry them, or was it the type of bean? Yup. We first air-dried them but due to our humid climate, they got moldy instead! So we put them in the dehydrator, about 100F for 6 hrs. till they looked a little shriveled got hard like little pebbles. I live in southeastern Colorado (4,000 ft. high desert plains), but would love more infomation about these beans. They sound very versatile. Thank you for your site. Las Animas Helping Hands is a 100% volunteer organization and our mission is to help people in our area with basic life needs. We partner with other community organizations to have a community garden to feed the needy. I’ve received funding for a greenhouse for the garden. Do you have a greenhouse? Have you heard of permaculture gardening and what are your thoughts? Thank you so much for your help! Your organization sounds wonderful! We’re hoping more people join hands in helping the needy not only have access to good nutrition, but also the skills, resources (like a garden plot, tools, etc), and knowledge to feed themselves. Good to hear from you, and good luck! Thank you so much for all of the links. I’m exploring them now. The idea of “teaching them to fish” is what we are after. However, there are so many in our area that are elderly & handicapped that we are trying to get food to those who can’t grow it themselves. I appreciate all of the suggestions and love your site! When funds are available I would like to have a subscription. Would I need two subscriptions….one for our home garden & one for our community garden or would I be able to do two different size plots from the same subscription? Thank you again for all of your great suggestions! I have a garden with lots of beans that I will let dry before shelling them. I have a big enough garden to warrent some kind of machanical sheller for DRY beans. Does anyone know of a good sheller for this purpose. I see the “Mr. Pea” sheller advertised but this is a bit small and I believe it is designed to handle dry beans after harvest in the Fall. I’m looking for a manufacturer who sells shellers. Can yo help? Thanks. Hi Robin – We haven’t gotten that many shelled beans to date, but if we do, we’ll definitely be looking up the sheller gizmos and let you know. Thanks for looking in! I ordered the yin yang beans and have a ‘great’ harvest almost ready to shell. Question: Can I reserve seeds to plant next year or are these a hybrid? Also I am just going on instinct in the harvest. I have pulled the entire bean plant and put them in the sun to dry. When they do, I suppose you just work at opening the pods and taking out the beans. If done this way do I still need to spread them out to dry more before storage? I am in SE Idaho, elevation 4500 ft. 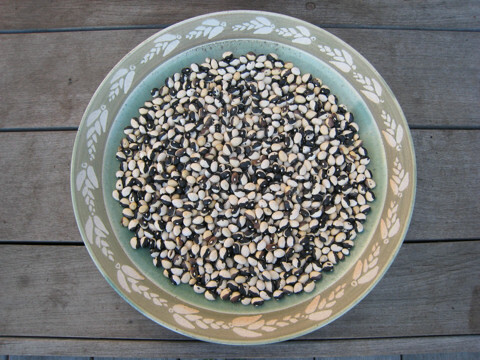 Yes you can use the Yin Yang beans for next years seeds. 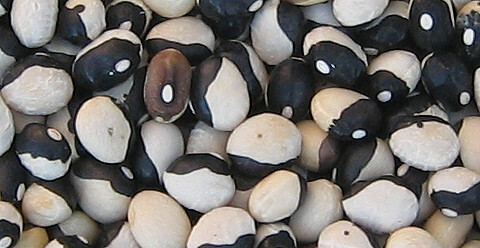 Pick the biggest and best beans to use as seeds. I normally let the shells dry on the plant. The color develops over time and if you pick too early you won’t get the true black and white color. Some may be grey and white. They are watered by well water. Any suggestions for next year? It is not uncommon for apple trees to take a break every other or every third year and produce less apples. This year could be a combination of lower yield that was lowered further by hail. If the tree goes into ‘survival mode’ it may drop fruit to save itself. This year I would write off to the hail and stress on the tree. If it does it again next year or shows signs of stress next spring I would sample the soil and see if you are missing any nutrients. (Since you have had a good year, this is not the first thing I would suspect) I had a lemon tree that produced all the first fruit on it and a bit more after I transplanted it. Then it took a 2 year break while it established roots (I am guessing that it what it was doing) then a big above ground growth spurt and a resumption of lemon production … and then we moved.